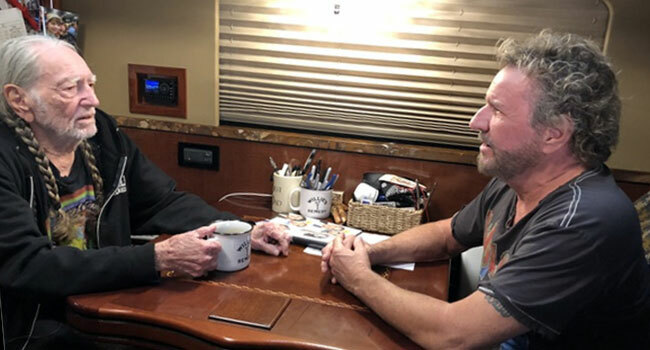 AXS TV has announced the return of the popular music interview series Rock & Roll Road Trip With Sammy Hagar Presented By Seminole Hard Rock Hotel & Casino Hollywood, FL, premiering Sunday, May 5th at 8 pm ET. Hosted by beloved rock showman Sammy Hagar, the upcoming series puts the spotlight on 12 all-new episodes as The Red Rocker (Hagar) talks and rocks with a roster of enduring icons. Additionally, the network is proud to welcome the world-famous Seminole Hard Rock Hotel & Casino Hollywood, FL as the exclusive presenting sponsor of the popular series. The Seminole Hard Rock Hotel & Casino Hollywood, FL serves as the backdrop for one of the season’s most unforgettable episodes when Hagar heads to the resort and casino to perform his biggest hits on the Hard Rock Event Center’s legendary stage. The star-studded guest list includes country legend Willie Nelson; as well as Rick Springfield in a special episode shot on location at his home; multi-platinum rockers REO Speedwagon; celebrity chef/TV Host Guy Fieri; renowned comedy duo Cheech & Chong; Country Music Hall of Famer Charlie Daniels; stock car superstar — and seven-time NASCAR champion — Jimmie Johnson; groundbreaking Doors guitarist Robby Krieger; blues rock revolutionary Joe Bonamassa; and a special drummers episode with prolific percussionists Kenny Aronoff, Sheila E. and Jason Bonham, who gives an exclusive insider’s look at the making of his new album. As part of AXS TV’s partnership with the Seminole Hard Rock Hotel & Casino Hollywood, FL, the network will present a series of weekly vignettes covering the latest in music news and information in the Seminole Hard Rock Hollywood Music Minute , covering everything from concert tour dates and artist announcements, to music festival news and profiles of up-and-coming artists. Additionally, the series will highlight events at the Seminole Hard Rock Hotel & Casino Hollywood, FL, while taking viewers behind the scenes on the venue’s storied grounds, which includes the renowned Rock Vault — the temporary home to Hagar’s trademark checkered suit worn during his performance with Van Halen at the 1992 VMAs. The iconic ensemble is now on display along the marble-floored concourse of the newly opened casino at the resort, right next to David Bowie’s “Glass Spider” red suit, which he wore during the 1987 tour.